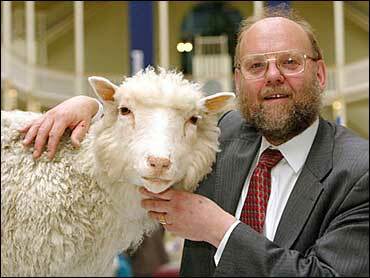 The creator of Dolly the sheep, the world's first mammal cloned from an adult, applied for a human cloning license Tuesday to study how nerve cells go awry to cause motor neuron disease. Ian Wilmut, who led the team that created Dolly at Scotland's Roslin Institute in 1996, said he plans to clone cells from patients with the incurable muscle-wasting disease, derive blank-slate stem cells from the cloned embryo, make them develop into nerve cells and compare their development with nerve cells derived from healthy embryos. Such work, called therapeutic cloning because it does not result in a baby, is opposed by abortion foes and other biological conservatives because researchers must destroy human embryos to harvest the cells. The United Nations is scheduled to vote on a convention on human cloning next month. The United States is leading a call for the convention to ban all forms of human cloning, while Belgium heads a faction seeking a ban on reproductive cloning but the option for countries to approve therapeutic cloning. Britain became the first country to legalize research cloning in 2001, but only now are scientists ready to start using the technique. They hope it will revolutionize medicine by providing better treatments for a wide variety of illnesses. The Human Fertilization and Embryology Authority, Britain's fertility regulator, granted the country's first license for human cloning last month to a team at Newcastle University that hopes to create insulin-producing cells that could be transplanted into diabetics. But the latest project does not involve the transplant of genetically matched stem cells, an approach that experts say would be particularly challenging in motor neuron disease because the cells are so big and have to develop and extend their cable-like projections long distances to connect with muscles. The mechanism behind motor neuron disease is poorly understood because the nerves are inaccessible in the brain and central nervous system and cannot be removed from patients. "At the moment we have to rely on post-mortem tissue and that's very much the end stage," said Dr. Brian Dickie, director of research development at the London-based Motor Neuron Disease Association. "What we don't have, and what we desperately need, is a way to study human motor neurons as the disease progresses. "If we're going to develop a treatment the chances are that we are going to have to catch the disease at a relatively early stage," he said. Motor Neuron disease is an umbrella term for a collection of illnesses of varying severity that all lead to loss of muscle function because of nerve failure. About 350,000 people worldwide are afflicted and about 100,000 die from it every year. About 10 percent of those stricken live for a decade or more, like celebrated physicist Stephen Hawking, who has a type of motor neuron disease called amyotrophic lateral sclerosis, or ALS, also known as Lou Gehrig's disease. However, most die within five years of the onset of symptoms, which usually start in middle age. An inherited defect in a single gene is responsible for about 2 percent of cases of the disease. Another 8 percent of cases are caused by some other, yet unidentified, inherited genetic abnormality. Stem cells are the master cells of the body that go on to become every bone and tissue. Wilmut and his colleagues plan to produce three groups of stem cells. The first group would be regular stem cells extracted from a donated healthy embryo. The scientists would then take some of those cells and inject them with the damaged gene known to cause 2 percent of the cases to make the cells develop the disease. To obtain the third type of cells, they would clone a blood or skin cell from a patient whose motor neuron disease is inherited but caused by unknown genetic abnormalities. The resulting cloned embryo would then be mined for its stem cells. All three groups of cells would be induced to grow into neurons and the scientists will track and compare the development of the healthy neurons, the neurons with a single gene defect and those with the unidentified genetic problem. "We believe this particular combination of cells would be extremely powerful in revealing the differences in function of the cells and, for the first time, make it possible to look at the gene expression, the protein production, the metabolism — everything — in those cells to see where they begin to go wrong at a stage which would be equivalent to the very early life of one of the patients," Wilmut told reporters. Even though only 10 percent of cases are known to have genetic causes, the research would still benefit the other 90 percent of patients, experts said. "One of the beauties of this approach is that we don't need to identify the other genetic causes," said Dickie of the Motor Neuron Disease Association. "The way in which a motor neuron dies will be very similar regardless of the cause. We will learn about all forms of the disease." Wilmut said he hopes for a response from the fertility regulators early next year and to begin work in the spring.